/ DIY Workshops - leaf-audios Webseite! In our workshops we offer to build our own DIY kits - experimental Oscillators, Fuzz Boxes, Eurorack Modules, Drone Synths, Microphonic Soundbox. Over the years we developed lots of own projects. We guide you and generally beginners are welcome. Our workshops start with a soldering tutorial and no one leaves without a working machine, promised! 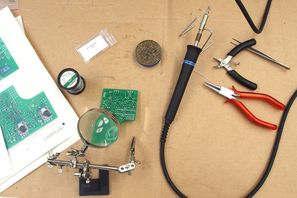 Thanks to our cooperation partner Ersa, our workshops are equipped with professional soldering irons and tools. 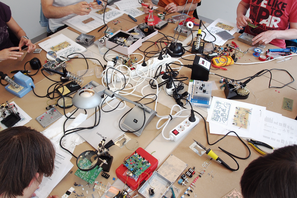 In this blog report by Elbphilharmonie Hamburg (german), you see how a workshop looks like. Here you find our current workshop dates. Click on the link for detailed info about the dates and registration. How is a workshop organised? What tools should I buy when I start DIY? Can we book you for a workshop? Over the years we developed lots of DIY projects. Some survived, some died. The most recent ones are collected here.